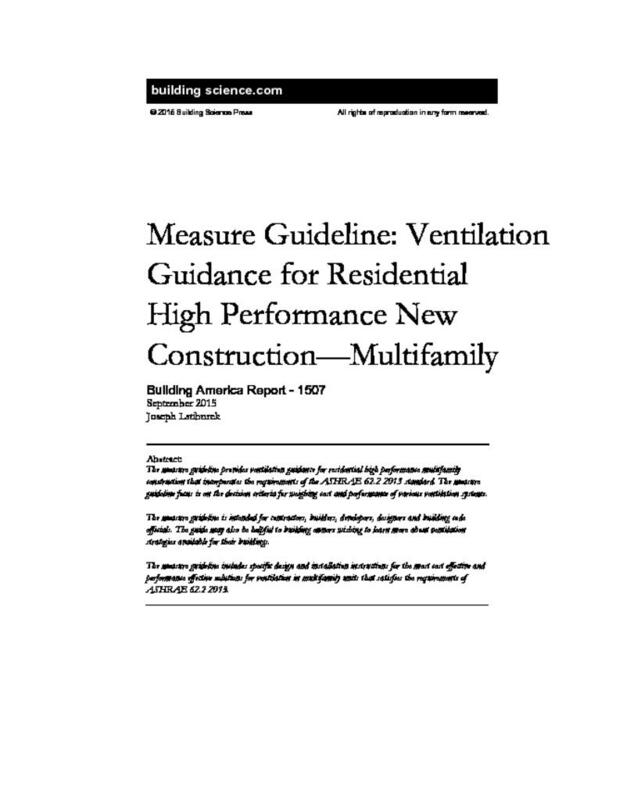 The measure guideline provides ventilation guidance for residential high performance mulitfamily construction that incorporates the requirements of the ASHRAE 62.2 2013 standard. The measure guideline focus is on the decision criteria for weighing cost and performance of various ventilation systems. The document is intended for contractors, builders, developers, designers and building code officials. The guide may also be helpful to building owners wishing to learn more about ventilation strategies available for their buildings. The measure guideline includes specific design and installation instructions for the most cost effective and performance effective solutions for ventilation in multifamily units that satisfies the requirements of ASHRAE 62.2 2013. Building America requires that single-family and multifamily buildings are compliant with ASHRAE Standard 62.2 – 2013. The standard has undergone significant changes since first being issued in 2003. One of the most significant is an increase in ventilation rates – almost a doubling of the ventilation requirements for a 1,000 ft2 multifamily unit (from 25 cfm to 45 cfm). Additionally, ASHRAE Standard 62.2 has a requirement for kitchen exhaust of 100 cfm. The ICC 2015 International Residential Code (IRC) requires building enclosures to meet an air tightness performance metric of 3 ach@50 Pa or less. The IRC does not distinguish between single-family detached construction and multifamily construction. ASHRAE Standard 62.2 – 2013 as amended by Addendum E, requires an air tightness performance metric for multifamily units of less than 0.3 cfm per ft2 of the dwelling unit envelope area at a test pressure of 50 Pa. Both of these metrics result in enclosure tightness that is significantly more than current typical single-family detached construction but typical of high performance single-family detached construction (Finch et. al. 2009; Maxwell et. al. 2014) and typical of individual unit multifamily construction that meet model code fire and smoke control requirements and inter unit acoustical control requirements (Lstiburek 2005). ASHRAE Standard 62.2 – 2013 also requires a continuous ventilation rate of 45 cfm for a one- bedroom enclosure of less than 1,000 ft2 floor area. No credit for infiltration is allowed for multifamily units. Additionally, ASHRAE Standard 62.2 – 2013 requires a vented kitchen range hood with a minimum intermittant exhaust flow of 100 cfm – or local kitchen area intermittant ventilation of 5 ach. Exhaust-only ventilation at the ASHRAE Standard 62.2 – 2013 rate leads to significant depressurization in units that are constructed to meet the 2015 IRC or ASHRAE Standard 62.2 – 2013 air tightness requirements (CMHC 2005; Lstiburek 2013) and pulls air from neighboring units and corridors. Exhaust-only ventilation is not a viable ventilation strategy for multifamily construction. Nor is exhaust-only ventilation with passive air inlets. Supply-only ventilation for multifamily construction at the ASHRAE Standard 62.2-2013 rates leads to significant pressurization of units. This has the unintended consequence of driving air into neighboring units and the resulting potential of odor and contaminant transfer. Only balanced ventilation strategies are viable for multifamily construction and effective for high performance multifamily construction. Additionally, exhaust vented kitchen range hoods in multifamily construction are only effective with interlocked powered make-up air. Local kitchen area ventilation of 5 ach is proving problematic as no definition of "local" has been provided that is enforceable. In warm-humid climates supplemental dehumidification is necessary in energy efficient homes where the sensible cooling load has been dramatically reduced (Rudd 2013). The issue is particularly acute in multifamily units ventilated at high ventilation rates such as those required by ASHRAE Standard 62.2 – 2013. These are significant changes to current practice and this measure guideline addresses these issues. Each of the ventilation system options presented in this measure guideline has advantages, disadvantages and costs. In almost all cases the advantages, disadvantages and costs are subjective not objective after minimum requirements are met. For example the choice of supplemental dehumidification is made by climate location. It is the only viable option in hot-humid and mixed-humid climates. No air conditioning systems currently exist that have sufficient dehumidification capability for multifamily units ventilated at ASHRAE Standard 62.2 – 2013 rates. Separate systems are required. The choice of forced air vs. radiant is typically a regional choice. Radiant heating with no cooling is a Pacific Northwest approach to multifamily unit space conditioning. One method of providing balanced ventilation in such units is with an HRV or an ERV. Balanced ventilation system units are commercially available without heat recovery or energy recovery. The advantage of heat recovery or energy recovery is the higher energy performance. In cases where a forced air system with air conditioning is compared with packaged terminal heat pumps (PTHP) little agreement exists. The cost of a ducted forced air system with outside air connected to the return side of the air handler coupled to an exhaust system in the bathroom(s) is similar to a ducted heat recovery ventilator (HRV) or energy recovery ventilator (ERV) providing the balanced ventilation with a PTHP. One has heat recovery/energy recovery and the other does not. It can be argued that since the costs are similar the HRV/ERV has an advantage due to the obvious energy savings. The counter argument is that maintenance and durability issues with a more complex system, such as an HRV/ERV, are not worth the energy advantage and the forced air system coupled to an exhaust system is viewed by others as preferable due to lower cost and less ductwork. Where forced air systems are preferred by the marketplace (typically a regional bias) a stand alone HRV/ERV that does not interact with the forced air systems is viewed by some as a less complicated system to install and maintain than integrating the ventilation system with the forced air system. The ICC 2015 International Residential Code (IRC) requires building enclosures to meet an air tightness performance metric of 3 ach@50 Pa or less. ASHRAE Standard 62.2 – 2013 as amended by Addendum E, requires an air tightness performance metric for multifamily units of less than 0.3 cfm per ft2 of the dwelling unit envelope area at a test pressure of 50 Pa. The 0.3 cfm per ft2 value was proposed by Lstiburek (2005). This level of enclosure tightness is significantly more than current typical single-family detached construction but typical of high performance single-family detached construction (Finch et. al. 2009; Maxwell et. al. 2014) and typical of individual unit multifamily construction that meet model code fire and smoke control requirements and inter unit acoustical control requirements (Lstiburek 2005). ASHRAE Standard 62.2 – 2013 also requires a continuous ventilation rate of 45 cfm for a one- bedroom enclosure of less than 1,000 ft2 floor area. No credit for infiltration is allowed for multifamily units. Additionally, ASHRAE Standard 62.2 – 2013 requires a vented kitchen range hood with a minimum intermittant exhaust flow of 100 cfm – or local kitchen area intermittant ventilation of 5 ach. Bathroom exhaust is also required at an intermittent rate of 50 cfm or a continuous rate of 20 cfm. Exhaust-only ventilation at the ASHRAE Standard 62.2 – 2013 rate leads to significant depressurization in units that are constructed to meet the 2015 IRC or ASHRAE Standard 62.2 – 2013 air tightness requirements (CMHC 2005; Lstiburek 2013) and pulls air from neighboring units and corridors. Exhaust-only ventilation is not a viable ventilation strategy for multifamily construction. Nor is exhaust-only ventilation with passive air inlets (Maxwell et. al. 2014). Supply-only ventilation for multifamily units at the ASHRAE Standard 62.2-2013 rate leads to significant pressurization of units. This has the unintended consequence of driving air into neighboring units and the resulting potential of odor and contaminant transfer. Only balanced ventilation strategies are viable for multifamily construction and effective for high perfomance multifamily construction (Figure 1). Additionally, exhaust vented kitchen range hoods in multifamily construction are only effective with interlocked powered make-up air. Local kitchen area ventilation of 5 ach is proving problematic as no definition of “local” has been provided that is enforceable. Installation of clothes dryers that are vented to the exterior also leads to significant depressurization in multifamily units. Clothes dryer exhaust rates are typically 200 cfm or more. Interlocked powered make-up air is necessary or alternatively unvented condensing clothes dryers must be used. Intermittent bathroom exhaust at 50 cfm in multifamily units is also not possible without provision for make-up air. High degrees of enclosure air tightness and unit compartmentalization are code required and a fundamental component of high performance construction. Acceptable indoor air quality is also a fundamental component of high performance construction. Ventilation approaches that are compliant with ASHRAE Standard 62.2 – 2013 within enclosures constructed in accordance with the ICC 2015 International Residential Code (IRC) currently are not typical. Ventilation is one component of an integrated approach to provide acceptable indoor air quality (IAQ) in buildings that includes source control of contaminants and environmental separation (the “building or unit enclosure”). Acceptable indoor air quality includes control of temperature and odors. Ventilation is the intentional movement of air from the outside of a building to the inside. Multifamily units share common surface areas with neighboring units (Figure 2). Ventilation air should not be pulled from neighboring units for fire and smoke control reasons, for odor control reasons and for general IAQ reasons. Figure 2: Multifamily construction – Multifamily units share common surface areas with neighboring units. Ventilation air cannot be pulled from neighboring units for fire and smoke control reasons, for odor control reasons and for general IAQ reasons. To prevent air from transferring between multifamily units high levels of air tightness are required as is the control of air pressure differentials. Common walls are also required to meet fire and smoke assembly requirements (Figure 3). Most floor assemblies in multifamily frame construction are sound proofed and fire proofed with liquid gypsum subflooring (Figure 4) that results in airtight wall assemblies at floor to wall connections. Ventilation air is prohibited by model codes from being introduced into multifamily units from corridors. Multifamily unit to corridor doors are typically weather-stripped (Figure 5). Ventilation air can only be introduced into multifamily units through infiltration through exterior walls or directly into the units by ducted supply or passive air inlets (holes in the exterior walls (Figure 6)) or slotted vents in windows. In multi-story construction stack effect driven airflows in buildings compromise smoke control and fire safety, adversely affect indoor air quality and comfort as well as increase operating costs for space conditioning energy (Figure 7). The air in lower units ends up in the upper units (Figure 8). By isolating the units from each other and from corridors, shafts, elevators and stairwells stack effect driven interior airflows can be controlled (Figure 9). This is referred to as compartmentalization (Lstiburek 2005). The most elegant argument for compartmentalization of multi-story buildings comes from Handegord (2001). Lower units should not supply air to upper units. Central systems that move air between units and floors for ventilation purposes result in multifamily units that do not meet compartmentalization air tightness requirements. Only distributed balanced ventilation systems work. . .